Every week, we find quick and delicious weeknight dinners—complete with a brief overview and grocery list—to take some of the effort off of your meal planning. Tonight: P.M. is the new A.M. Take a cue from breakfast and serve eggs and biscuits tonight for dinner. It's called "comfort food" for a reason: It's so delicious and satisfying that it makes you forget all about your never-ending to-do list or off-kilter day. For dinner tonight, take a cue from the ultimate breakfast comfort food, eggs baked in tomato sauce spooned over warm, buttery biscuits. The entire process takes roughly 40 minutes from start to finish, so you can enjoy the simple pleasure of breakfast for dinner in no time. Click through on the recipe photos or titles to see (and save and print) the full recipes, or take advantage of our handy grocery list below. We are assuming you have eggs, flour, butter, olive oil, salt, pepper, garlic, and onion. If not, add those to your list, too! 40 minutes before you plan to eat, preheat the oven to 450º F for the biscuits and make the sauce for the eggs in a large skillet. While it's cooking, mix the biscuit batter (which has only three ingredients!) and scoop the dough out onto the parchment paper. Brush the tops with cream, milk, or water. Bake the biscuits for about 10 minutes, or until they are lightly golden brown. By this time, your tomato sauce should be done. 10 minutes before you want to sit down: Make four depressions in the sauce, add the eggs, season them, then cover and cook to your liking. 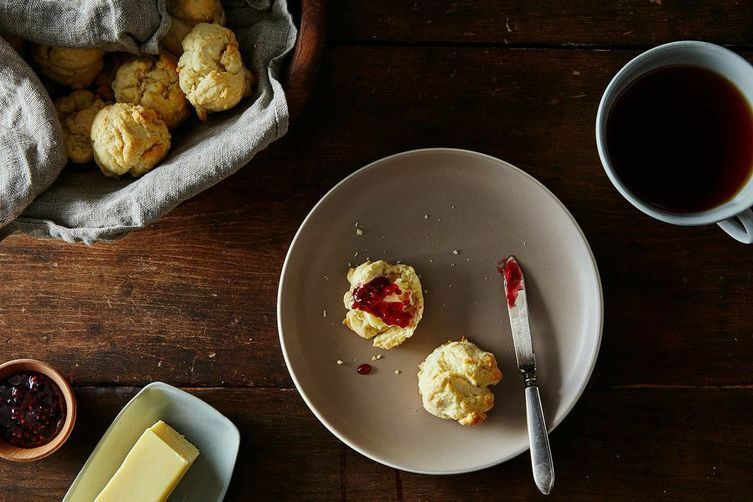 Take the biscuits out of the oven and allow them to cool. Serve them alongside the eggs so that they soak up any leftover sauce. What are you making for dinner tonight? Tell us in the comments below! Make absolutely right now. Seriously. 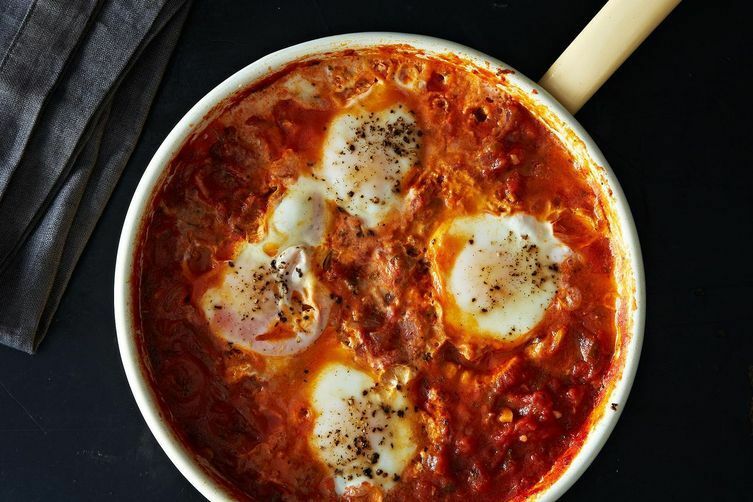 This is an Israeli dish called Shakshuka--and, my Afghan friends also prepare eggs very similarly. Lots of variations-add spinach, mushrooms,etc and serve with fresh naan--yummmm!